In 1947, on independence from Britain, the subcontinent was split into 2 successor states: the Dominion of India and that of Pakistan, both with the UK Monarch as Head of State and represented in each by a Governor General. East and West Pakistan was created from the frontier areas of British India, where the military had always been an integral part of local administration. Civilian institutions were correspondingly weak, provincial loyalties strong. Pakistan was created by the Muslim League to be a homeland for the Muslims of British India. However, Pakistan's new leaders found it hard to devise a constitutional structure that could unite the various provinces, and incorporate both the East and West portions of the country. Early state-building was further complicated by a war with India in 1947, and the early death of Pakistan's founding father M A Jinnah in 1948, and first Prime Minister, Liaquat Ali Khan in 1951. It took almost eight years to agree a final constitution. 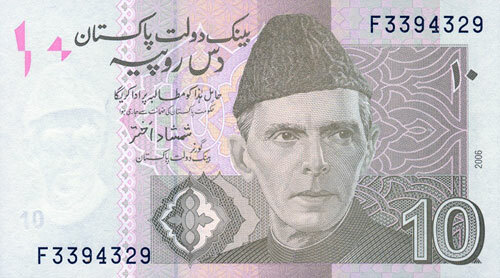 This established Pakistan as a republic within the Commonwealth in 1956. But the new parliamentary system was soon in difficulty: in 1958, General Ayub Khan launched Pakistan's first military coup. Martial law was declared, political parties abolished and a pattern of military control was established that has characterised almost half of Pakistan's existence since independence. In 1960 Khan became President. A new constitution, placing politics firmly under military guidance, was promulgated in 1962. But a failure to win a second war with India in 1965, mounting corruption and increasingly uncontainable Bengali frustrations in East Pakistan gradually undermined Khan's authority, finally forcing his resignation in 1969. The first election on a nationally democratic basis was conducted in 1970. The elections saw the East-Pakistan Awami League gaining an overall majority, which the West Pakistan administration refused to accept. This set the stage for a new constitutional crisis that in turn led to civil war in March 1971 and, following Indian intervention, the emergence of East Pakistan as the independent state of Bangladesh. A full chronology is available on the BBC News (http://news.bbc.co.uk/1/hi/world/south_asia/country_profiles/1156716.stm) website. The status of Kashmir and the history of events leading to its division have long been contested and led to at least three wars between India and Pakistan. India claims that the former princely state of Jammu and Kashmir legally acceded to it in 1947. Pakistan claims that Kashmiris were denied their choice of which state to join and has since held that the status of Kashmir can only be decided by a plebiscite in line with UN Resolutions passed in 1948. Kashmir has been divided since 1948 by a cease-fire line, known as the Line of Control (LoC). Pakistani-administered Kashmir is almost exclusively Muslim, divided between so-called Azad (“Free”) Kashmir and the more remote Gilgit-Baltistan, (formerly known as the Federally Administered Northern Areas). Indian-administered Kashmir is divided into three main and very different sectors: the Kashmir Valley which is mostly Muslim, Jammu which has a slim majority of Hindus, and Ladakh, which is sparsely populated and half Buddhist. Political orientations of people in Indian-administered Kashmir are not governed by religious identity alone. Each of these regions are internally differentiated on linguistic, religious and cultural lines. There has been continued violence in the Kashmir Valley between armed groups and the Indian security forces since the insurgency began in 1988/9. Levels of violence have fallen in recent years, but remain high: from a total of around 4,500 deaths in 2001 (including over 1,000 civilians) to around 381 in 2009 (including 78 civilian deaths). The Indian security force presence in Indian-administered Kashmir remains high, and there continue to be allegations of serious human rights violations by both militants and security forces. The Pakistani security force presence in Pakistani-administered Kashmir also remains high with strong controls on freedom of expression and constant security surveillance. There are reports of militant camps in Pakistani-administered Kashmir. The Indian Government has said that levels of militant infiltration across the LoC have begun to rise since 2009 after showing a decline since 2005. 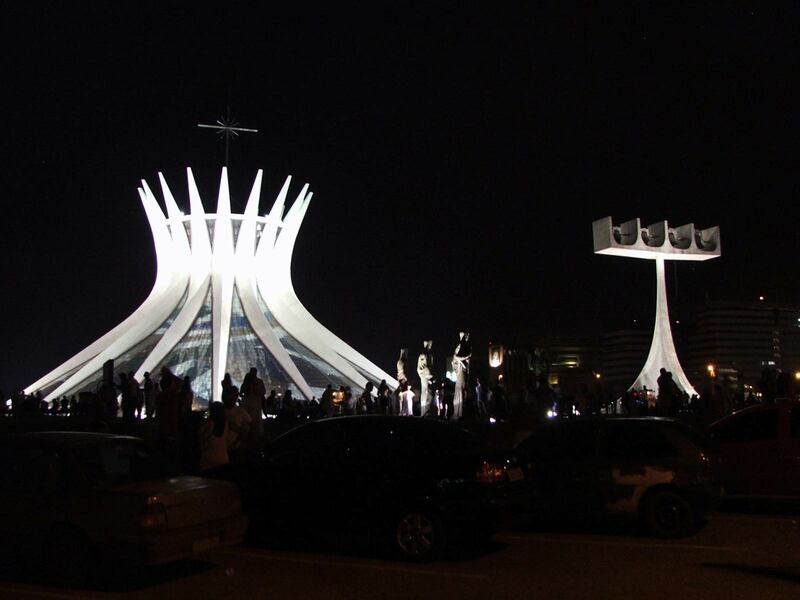 (official figures say there were 342 incidents of infiltration in 2008 and 485 in 2009). Since 2004, India and Pakistan have had several rounds of negotiations including a ‘Composite Dialogue’ aimed at settling all bilateral issues, including Kashmir. The Composite Dialogue remains suspended following the terrorist attacks in Mumbai in November 2008 but bilateral talks resumed in February 2010. Foreign Ministers of both countries met in July 2010 and are expected to meet again before the end of 2010. Both countries have agreed to a range of confidence building measures (CBMs) including the introduction of bus services on the Srinagar-Muzaffarabad and Poonch-Rawalkot routes to connect Kashmiris on both sides of the Line of Control (LoC). Five crossing points on the LoC have been opened to enable movement of people between both sides. India and Pakistan also opened up trade on select items across the Line of Control in October 2008. These CBMs are significant symbolic advances for both India-Pakistan relations and for the people of Kashmir. Prime Minister Manmohan Singh has held talks with several Kashmiri separatist leaders since 2005 and subsequently instituted five ‘working groups,’ comprising political party representatives and experts, to frame recommendations for addressing the issue. In October 2009, Indian Home Minister Chidambaram announced that he would start a “quiet dialogue” with moderate Kashmiri separatists. In September 2010 an all-party delegation from the Indian Parliament visited Kashmir to hold talks with a range of political leaders and ordinary Kashmiris. The long standing position of the UK is that it is for India and Pakistan to find a lasting resolution to the situation in Kashmir, one which takes into account the wishes of the Kashmiri people. It is not for the UK to prescribe a solution or to mediate in finding one. We welcome the positive steps being taken by Pakistan and India to build trust and confidence. We remain committed to our engagement in a practical way through the UK Government’s Conflict Pool, which continues to fund a number of projects designed to assist those in India, Pakistan and on both sides of the Line of Control with efforts to facilitate dialogue and address the causes and impact of conflict in the region. The first Summit in June 2009 marked the beginning of a long-term strategic EU-Pakistan partnership. It recognised the critical importance of a stable, prosperous and democratic Pakistan to the member states of the European Union. The second EU-Pakistan Summit, held on 4 June 2010, built on the outcomes of the 2009 Summit to further deepen and consolidate the EU-Pakistan relationship. The EU and Pakistan agreed to develop a five year strategic engagement plan, and to greater coordination in the areas of development, trade, security and human rights. In 2009 the EU remained the largest trading partner. EU exports to Pakistan totalled €3.9 billion and EU imports from Pakistan at €3.0 billion. Full details, including the European Commission's Country Strategy Paper for Pakistan (http://ec.europa.eu/comm/external_relations/pakistan/intro/index.htm) , are available on the Commission's website. Prime Minister Cameron and President Zardari agreed to strengthen UK-Pakistan relationship in London on 6 August 2010 though an enhanced UK-Pakistan Strategic Dialogue. This will lead to strengthened co-operation between the two countries in areas of global and regional peace and stability, people-to-people links, trade and investment, education, culture, and parliamentary. A joint statement released on 6 August 2010 by the Prime Minister and President Zardari is available on the Number 10 website (http://www.number10.gov.uk/news/speeches-and-transcripts/2010/08/pm-and-president-zardari-at-chequers-54357) . If progress is made on reforms, as with other partners, the UK’s aid to Pakistan will average £350 million per year over four years. Increased aid to Pakistan will be linked to progress on reform as the Government of Pakistan takes steps to build a more dynamic economy, tackle corruption and bring stability. 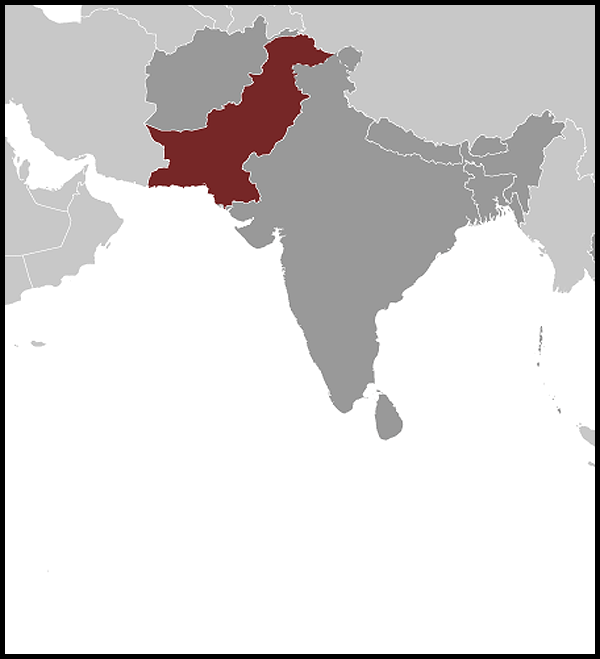 Pakistan is about three-and-a-half times the size of the UK. It shares borders with 4 countries: India to the east, China to the north east, Iran to the south west and Afghanistan along the western and northern boundaries. Pakistan's coastline on the Arabian Sea is 1,064 km long. The climate can be roughly split into 3 seasons: cool (October through February), hot (March through June), and wet (July through September). There are, however, significant regional variations. Pakistan is divided into four provinces: Balochistan, the Khyber-Pakhtunkhwa (formerly North-West Frontier Province), Punjab and Sind. In addition to the four provinces there are also the Federally Administered Tribal Areas (FATA), the Federally Administered Northern Areas (FANA), and the Islamabad Capital Territory. 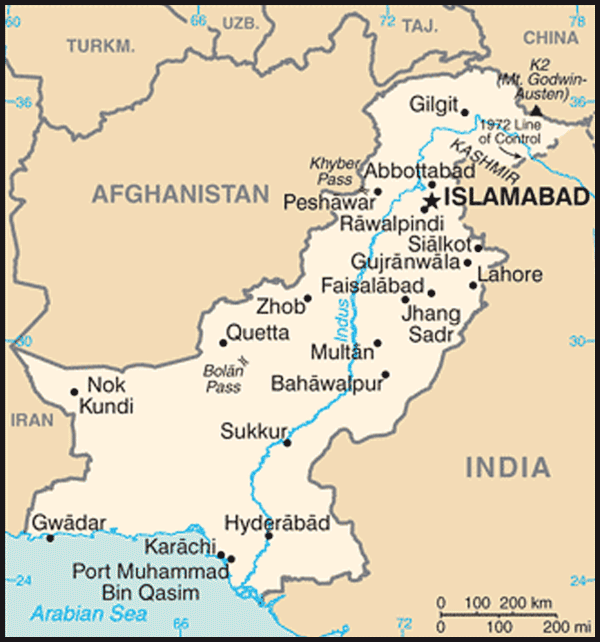 Pakistan-administered Kashmir is known in Pakistan as Azad Jammu and Kashmir (AJK). Bilateral trade between the UK and Pakistan has grown steadily since 2000 and is now worth some £ 1013 million a year. The UK is the 4th largest trading partner among OECD countries and the only one where the balance is in Pakistan's favour. The main sectors of opportunity for UK are specialised industrial machinery, power generation machinery, telecom & broadcasting equipment, chemicals, pharmaceutical and medical products and metalliferous ores and metal scrap. The UK is a key market for Pakistani exports, particularly textiles, rice, leather and leather products, carpets and fruit. The UK is the 2nd largest overseas investor in Pakistan; UK Foreign Direct Investment to Pakistan was £175 million in 2008/09. UK exports to Pakistan in 2009 reached £458m and UK Imports from Pakistan in 2009 were worth £646.1m. Follow this link (http://www.ukti.gov.uk/export/countries/asiapacific/southasia/pakistan.html) for the UK Trade and Investment profile of Pakistan. Pakistan has a federal parliamentary system, comprising of two houses: the Senate (upper house) and the National Assembly (lower house). For a bill to become law, it must be passed by both houses and signed off by the Prime Minister and the President. The National Assembly’s members are elected to 5 year terms (the length of the parliamentary term) unless the Assembly is dissolved early (which is at the instigation of the Prime Minister). The National Assembly elects the Prime Minister, who is the head of government and must be a member of the National Assembly. On 24 March 2008, the National Assembly elected Yousaf Raza Gilani as Prime Minister. The Pakistan People’s Party (PPP) holds the most seats, but no overall majority and so currently leads a coalition government. 92 of the Senate’s members are elected by each of the four provincial assemblies, which are represented in equal number. There are 12 additional members from the Federally Administered Tribal Areas and the Islamabad Capital Territory. The Federal Cabinet is drawn from both the National Assembly and the Senate. The President is the head of state. They are elected to five-year terms by an electoral college consisting of members of the Senate, National Assembly, and provincial assemblies. The President can serve a maximum of two consecutive terms. The current President is Asif Ali Zardari, who was elected on 6 September 2008. The 18th Amendment, passed in April 2010, has granted provinces authority over much of what was previously federal policy including areas such as education and health. The British Government continues to be concerned about the human rights situation in Pakistan, particularly that of religious minorities. The cases of individuals facing the death penalty on blasphemy charges have attracted parliamentary and public interest in the UK. Other human rights issues of concern include discrimination against the Ahmadi community, forced marriages, honour killings, child and bonded labour and the treatment of women, particularly in rural communities. With our EU partners we will continue to urge the Pakistani authorities to redouble their efforts to bring the perpetrators of human rights violations and terrorist acts to justice. We continue to urge the Government of Pakistan to fully guarantee the fundamental rights of all Pakistani citizens, particularly the most vulnerable (women, minorities and children) as laid down in the Constitution of Pakistan and in accordance with international human rights standards. An overview of the FCO’s human rights policy, including a link to the 2010 Human Rights and Democracy Report is available here (http://www.fco.gov.uk/en/global-issues/human-rights/) .